Give your regular old plain rice a break with this flavor packed rice with tomatoes and freshly ground spices. 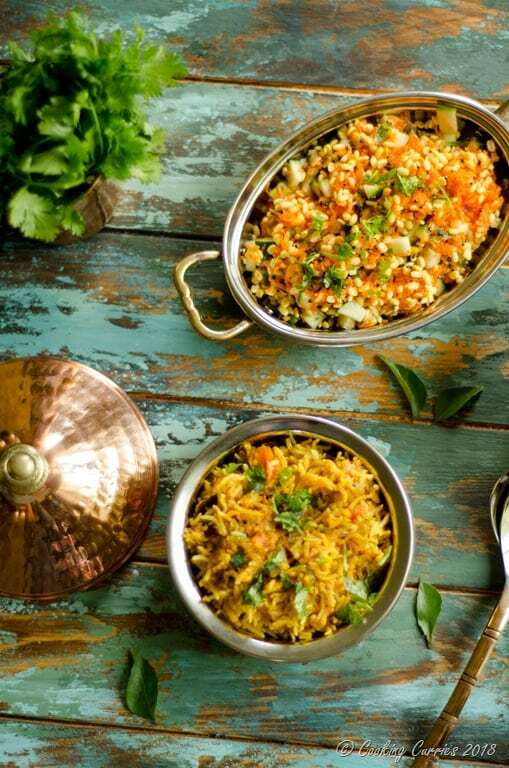 A side of raita or even just plain yogurt with this Tomato Rice and your meal is set! I first read this recipe years ago in a blog ( which unfortunately does not exist now) and this has been my go-to recipe for Tomato Rice ever since. I have made this for everyday meals, for guests, for parties, even taken it for potlucks and every single time, every one has raved about it. 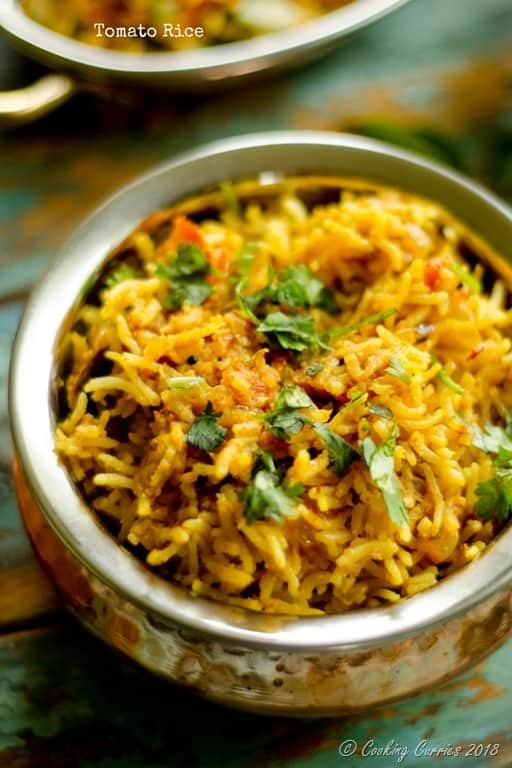 And every single time, every one expects a plain something rice, only to be surprised by the flavor brought in by all the fresh spices and how they complement the flavor of the tomatoes. This is especially a great recipe to make if you have some leftover cooked rice and need to make something a little special out of it. All the ingredients in it are fairly simple , that you will find in any Indian pantry. If you don’t have a full fledged pantry, they are all available in most stores or international grocery stores or online stores. I have linked the ingredients to where you can buy them. ( they are affiliate links though, which means you don’t pay anything extra but I get a little commission if you buy through the link. So, thanks ). Give your regular old plain rice a break with this flavor packed rice with tomatoes and freshly ground spices. 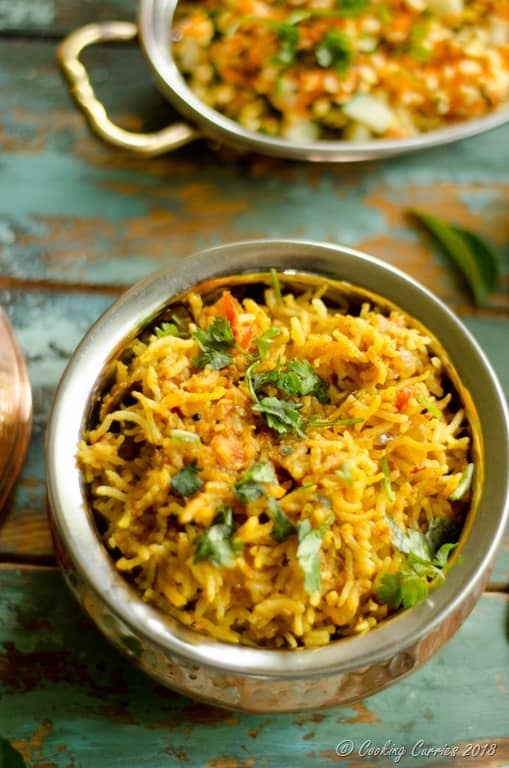 A side of raita or even just plain yogurt with this Tomato Rice and your meal is set! Heat a little oil in a pan, add the ingredients for the masala and fry them for a few minutes. Let them cool. Grind them to a coarse paste and keep aside. In the same pan, heat some more oil, add the tadka and let the mustard seeds splutter. Add the onions, green chillies, turmeric powder and saute for a while. Add the chopped tomatoes to it. After a while, add the ground paste to it and let it fry for a while. Add salt to taste and finally add the rice and mix well. Garnish with chopped cilantro leaves, get some curd n papad and you are all ready to enjoy the most delicious tomato rice ever. Note that some asafetida brands are not gluten free, please check the ingredients on the packaging to make sure, if you want to make this recipe gluten free. Delicious recipe.. impressed with detailed procedure. Love your photography..